This is as easy as it gets. 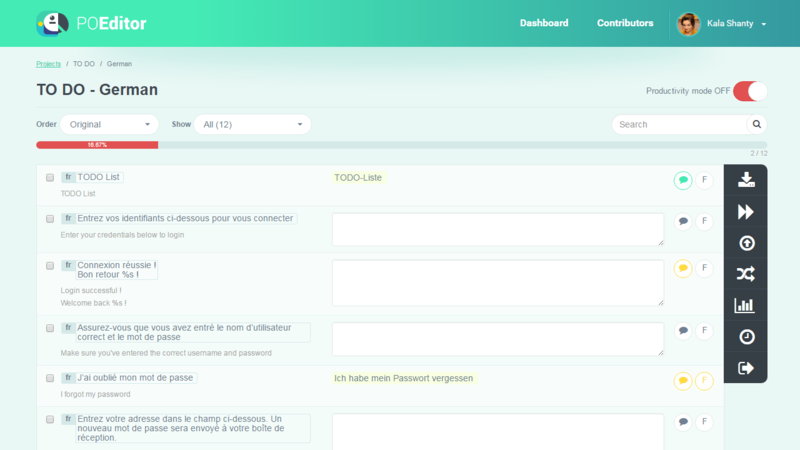 All you have to do is access the Language page (by clicking on the project in your Dashboard), and type in the translation in the empty boxes on the right, corresponding to the texts in the left column. Your work is saved automatically. To make it easy for your team to see the translations that require reviewing, just hit the F button (Fuzzy). All project members with access to the language will be able to filter the fuzzy translations using the Order and the Show menus. Sometimes, when translating software strings, you will come across some technical stuff that has to be preserved, in order for the localized software to work properly. POEditor shows visual notifications whenever you encounter placeholders, newlines and whitespaces, and when your translation exceeds the length of the original string. The Realtime Translation System shows you if another contributor is on the Language page. It also shows in real time if a translation is added, edited or deleted. The system will mark the translation fields that are being worked on by coloring their borders and, in case someone else is editing the same translation as you, a notification bubble will pop up. If you have something to say to your team regarding a translation, hit the button with a speech bubble icon next to it. 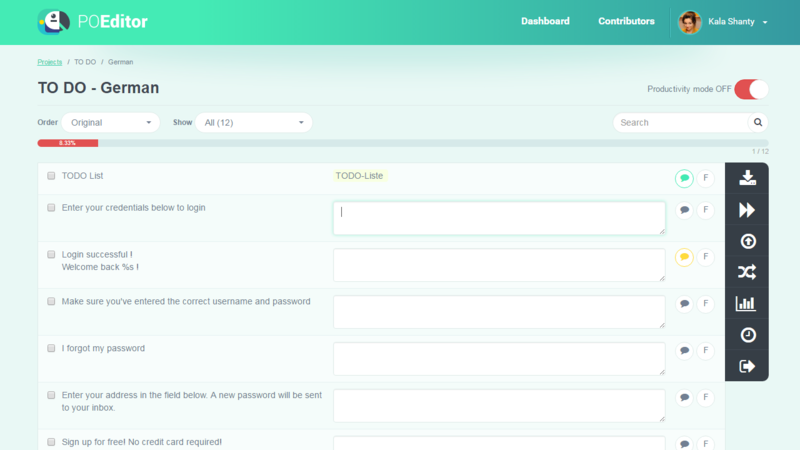 It will open the comment section corresponding to the term-translation pair at hand, where you can type in your comment or view the comments made by other team members. The comment button will be green if an admin or the project owner last commented on the string, and yellow if a contributor last posted a comment. Using the Order and Show menus, you can choose to see in the Language page only certain strings. To see the untranslated terms only and also strip down the interface to the most essential features for translation, hit the Productivity mode switch to ON. This should speed up the translation process. To save the strings to your computer in one of the supported file formats, push the Export button in the right-hand Options Menu. In Advanced Options, you can filter specific groups of strings and to edit the filename. 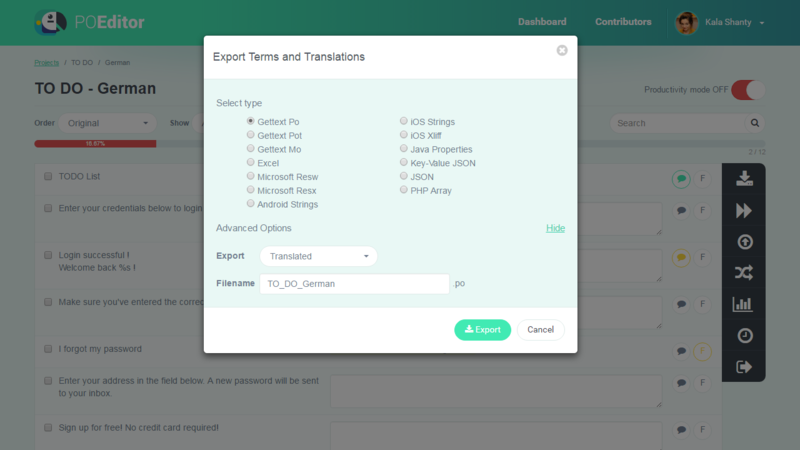 To add translations from a file to a language in the localization project, use the Import translation from file button in the Options Menu. 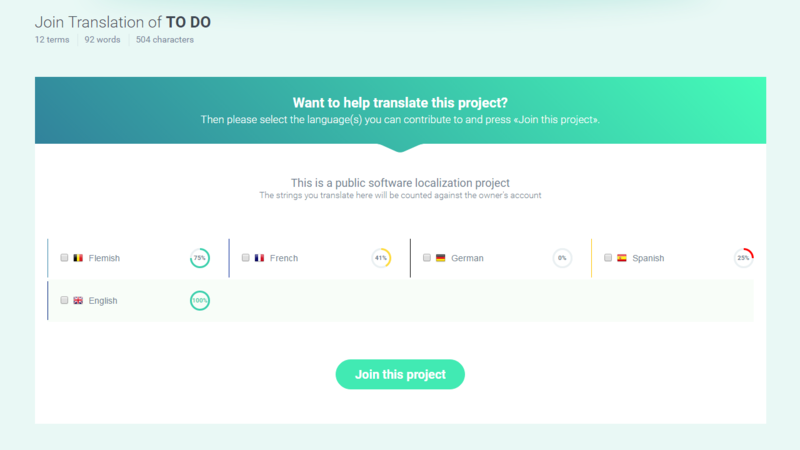 If you check the box to overwrite old translations, all the translations in the project will be updated with those in the file. Otherwise, only the empty translation fields will be filled in. Clicking on the Translation Stats button in the Language page, you’ll be able to see your contribution to the language localization process: Words, Chars, Translations (number of translated strings) and the Percentage of completion. If you’re working on a software localization projects with labels, which has a Reference Language set, Reference Words (RC) and Reference Chars (RC) will also visible. 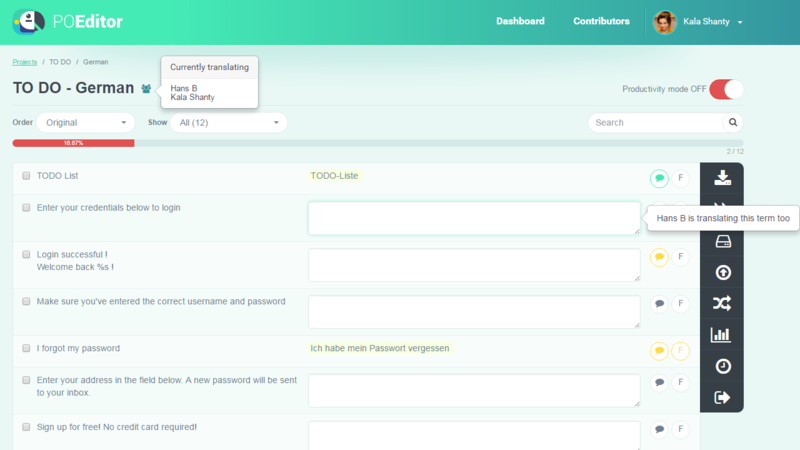 Under Translation Stats, you can find the Translation forecast feature, which estimates the date of completion for the language localization, based on your translation pace. 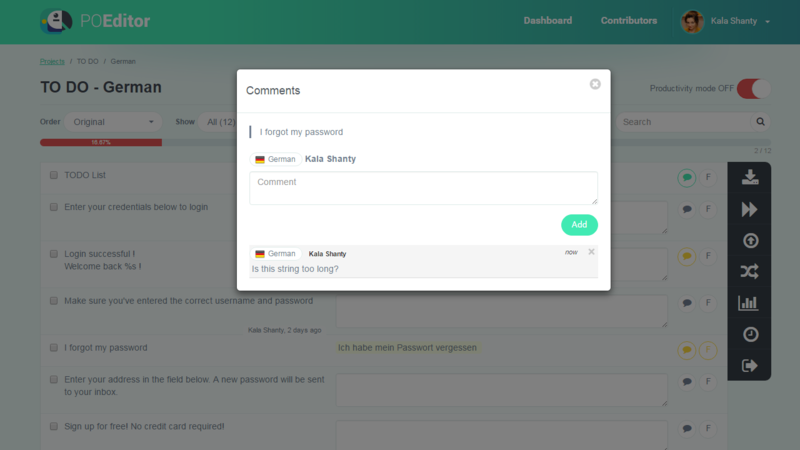 This feature only appears if the project owner or an admin has granted you read access to all the languages in the project. The translations in the Reference Language you choose will be displayed above the original terms. To view previous translation versions, use the History link next to each term. This link will not appear if the string was never translated on POEditor. 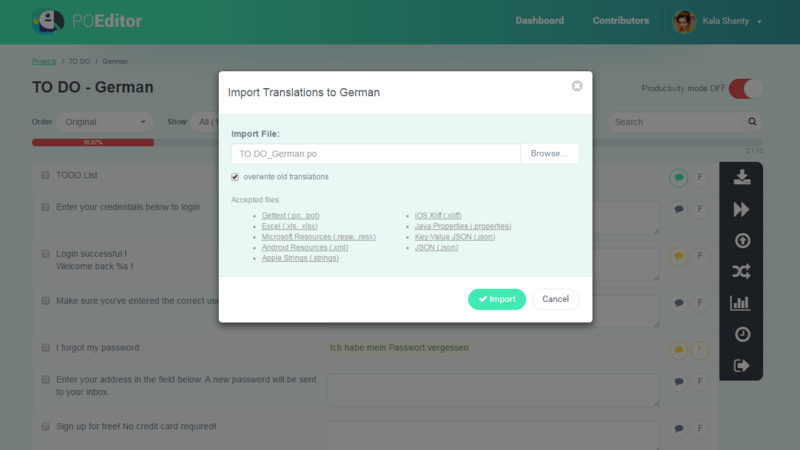 If the project owner has granted you access to the Translation Memory, you can use this feature to fill in the empty translation fields with the most frequently used translations saved in the database. Translations can also be loaded individually using Translation Memory suggestions (must be turned on by the project owner). Once you’re aware of the features POEditor has to offer, you should be able to ace your translation job without any effort.